Even without a museum building, the NLEM Education Programs are already underway. We hope that those who have participated in our “Behind the Scenes Collection Tours,” the “Project Citizen Partnership Program,” “What’s in the Evidence,” or the “Federal Agency Brown Bag Lunch Group” would agree that the National Law Enforcement Museum has some interesting activities in the works. By getting our Education Programs off the ground at this stage, we can begin to get people excited about the Museum and build relationships that will be key to its success once the doors are open. 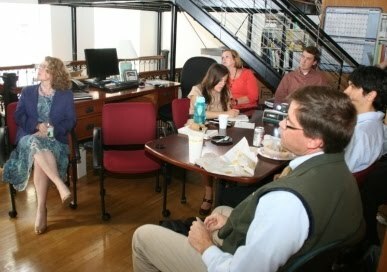 This month marks the one year anniversary of the Museum’s Federal Agency Brown Bag Lunch Group activities. Discussion topics have included information about the Federal Bureau of Investigation, the U.S. Marshals Service, the Internal Revenue Service Criminal Investigation, the role of the District of Columbia Metropolitan Police Department in safeguarding the streets of the federal government and other subjects. With a larger goal of building relationships between federal law enforcement agency historians, history buffs and the Museum staff, an interesting group of professionals finds themselves coming together on the fourth Thursday of every month to learn more about one another’s work. The format of each monthly Brown Bag program varies. 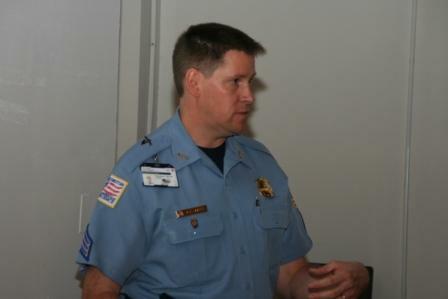 Experts in specific areas of law enforcement history have prepared formal presentations. Relevant news articles have been shared ahead of time and used to prompt less formal group discussion. Later this year, an expert in audio description will share information with staff and stakeholders about steps museum staff should take to ensure a positive experience for a broad audience that includes people who are vision impaired. What each program has in common is that they are fun and fairly informal get togethers. Although it’s a small group now, we look forward to growing the group over the next several months. As our Museum Volunteer program gets off the ground early this summer, we look forward to offering the Brown Bag Lunch activities as a volunteer benefit. If you have a topic to present or are interested in finding out more, please let us know. Laura McKee, our NLEM Graphics Imaging Project Intern, is a student in the graduate museum studies program at Johns Hopkins University in Baltimore, Md. She is currently interning with the National Law Enforcement Museum to learn how to catalogue and write about artifacts. To say that something or someone is “history” is usually a sign of disrespect. However, at the National Law Enforcement Museum, historical artifacts have a significance in American culture that can flow seamlessly into the present and even into the future. 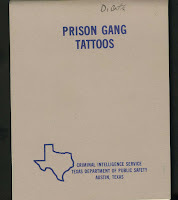 Take, for example, the small, soft-cover handbook of prison gang tattoos (circa 1980s) published by the Crime Analysis Section of the Texas Department of Public Safety’s Criminal Intelligence Service. Despite its modest appearance and low production values by today’s standards, this little booklet provides a fascinating glimpse into the dark, often-obscure world of prisoner identity politics. 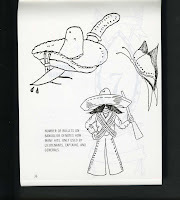 It has a glossary of “gang slang” and descriptive summaries of violent prison gangs ranging from the American Nazi Party and the Mexican Mafia to the Mandingo Warriors. 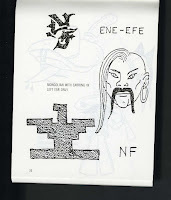 It’s also filled with illustration after illustration of tattoos, some with text and some without, but each evidencing a rich imagery and symbolism that can be linked directly to the probable criminal activities and ideologies of certain inmates. Why is this handbook important? Its place in the past, in the history of law enforcement, is indisputable—Texas authorities used it to discharge their duty to protect and serve civilians, to identify gang members, and to map their potential behavior both in and out of prison. But what about this artifact’s relevance, almost three decades later, to current cultural trends and security concerns? Today, 24% of Americans aged 18-50 years have one or more tattoos. Among Americans aged 18 to 29, the rate goes up to 36%. Those statistics, taken by themselves, are innocuous; however, they become meaningful when they intersect with the fact that there are now over 2.4 million people incarcerated in the United States. In this light, the prison gang tattoo emerges as a long-standing indicator of separateness from the American mainstream, a continuously reliable mark of social deviance. 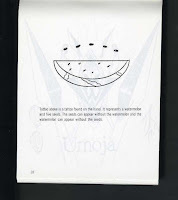 It would also be interesting to ascertain if the twentieth-century tattoos in the booklet are similar or identical to the tattoos worn by present-day prisoners. Do you or somebody you know have experience working with prison gang members? Or have an interest in this critical aspect of the exploding phenomenon of U.S. prison gang membership? Tell us what you think!